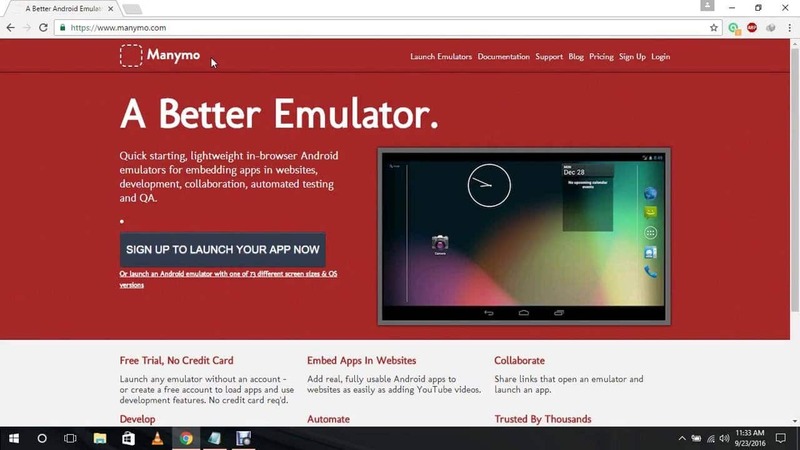 Lightweight Android Emulator: As you might be knowing, Android Emulators allow the users to develop and test and use the android applications without even bothering the android device. You get to use all the android apps and even android video games on your PC. Now isn’t that cool? And that is what today’s topic is all about. In this article today we will be sharing with you the best Lightweight Android Emulators. But before that, let us see a short intro for the newbies! 1 What are Android Emulators? 2 How do Android Emulators Work? 3 Why / When to use Android Emulators? Android Emulators are a sort of tool that provide you the Android Operating System on your Computer! Android Emulators are basically the Virtual Android Devices that can run on any Windows or Mac powered computer. They were developed back in the year 2010. And from there, they have been popular and most preferred means to have a better experience of your android apps and games on your PC. There are in all 15 different types of emulators basically distinguished on the types of features they provide. What kind of features you want to decide what sort of emulator could turn useful to you. 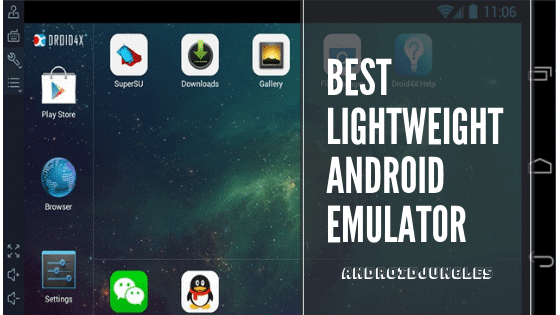 In no particular order we have mentioned below the list of the best Lightweight Android Emulators. If you want to know what our opinion about which the best Lightweight Android Emulator is, then do have a look at the final words at the end of the article. How do Android Emulators Work? As you all might be aware of the fact that Android is an Open Source Software. Which means, the open source of Android allows the developers to alter the system as per their choices and will. As android emulators are also known to be the Virtual Android Devices, even Google provides the Android SDK Tools that have an Android emulator inside it. 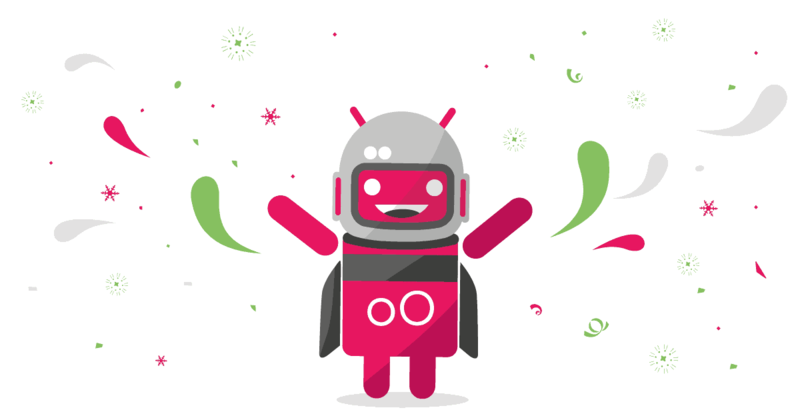 The main objective behind the development of android emulators and its use on the computers is for the developers to check and test their applications. With the help of Android Virtual device and its ecosystem, the developers get helped in selecting the hardware and software environment so as to make appropriate devices for the applications they have been developing. The application developers get a real experience with the help of the Android virtual devices, i.e. Android Emulators. The Android Emulators help the developers to emulate the text messages, incoming calls, and nearly all the operations that can be performed on a real android device. This whole phenomenon useful for the developers was modified by various companies like Bluestacks brought up the emulators that required the users to do the least. One of those emulators is the Bluestacks App Player that was released in the year 2011. This emulator turned out to be an absolute package for those who wished to have an android experience on their Computers and lesser complexities. After having a look at how Android Emulators work and origined, let us now know why and when should you make use of these Android Virtual Devices. These could also be the reasons to consider using an android emulator. In other words, given points that are mentioned below also emphasize the uses of the Android Emulators. Why / When to use Android Emulators? Given below are some of the occasions or reasons for where and when and why you should or you can make use of Android Emulators. You can also consider the given points as uses of Android Emulators. If you are a game freak and wish to enjoy the games with more involvement like a bigger screen and powerful music effects then Android emulators will help you run the game on your PC. In case you do not own an Android Phone, you can use the Android Operating System on your Computer. If an application is not available for PC but there is an android version of it, i.e. there is no Computer version of the Android app you wish to open on the Computer, with the help of Android Emulators you can run the Android app on your Computer. 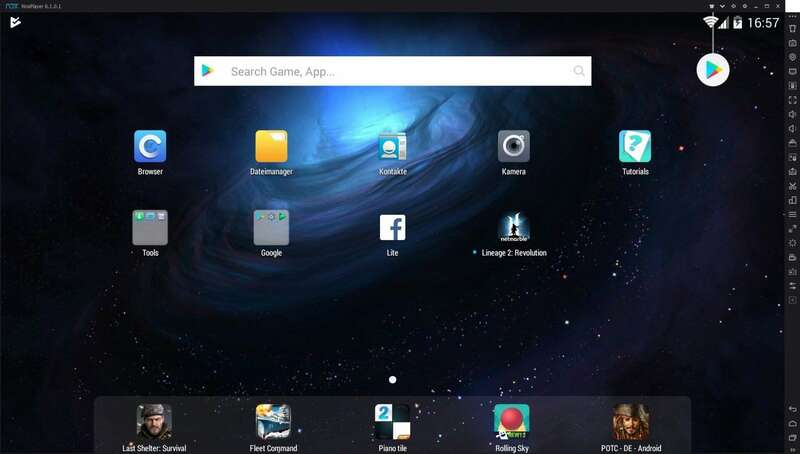 You can make use of the Mouse and keyboard of the Computer to play Android app games on PC. Specifically, the FPS games can be more fun this way. With the bigger screens of computer, while playing the android games on PC, you also get amazing sound effects of that game when played on PC than Android device. If you are or wish to be an android application developer you can mimic your applications on the emulator which turns out to be really useful in app developing. In case you own an android that has a weak hardware which otherwise cannot run heavy data consuming games, the android emulator will help you play that same game on your PC and with much more enhancement. There comes no device compatibility or Operating system compatibility issues as the emulators are flexible enough. 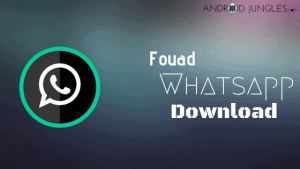 When your Android Phone run out of storage, which is a very usual phenomenon, you can use the computer for storage and other purposes with the help of Android Emulator. Just as mentioned earlier, Bluestacks is one of the most preferred, actually the most, and the oldest of all emulators. 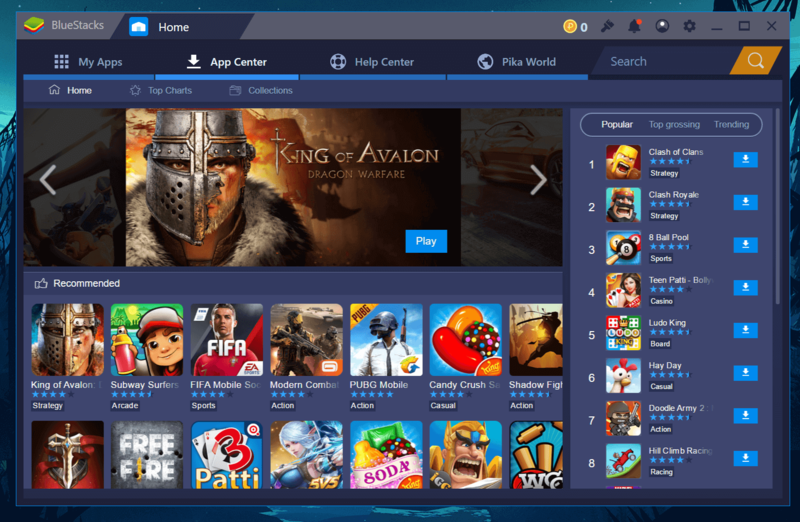 Although Bluestacks has now been discontinued for Windows, it still does run on Mac OS. It is more of a complete package for those who wish to have an android tablet running on their PC. Bluestacks is no doubt the best emulator for Mac. With the best User Interface, you get a single screen that displays you the application suggestions, tabs, and a notification bar as well. You can log in by using your Google Account through which you get an access to the Google Play Store. Up to date graphic drivers from Graphics manufacturer. Mac OS Sierra or higher. You should be the administrator on your PC. Apply the latest updates from the App Store app on your Mac. The android emulator- Nox Player is Based on Android 7.1.2 Nougat and is developed by Big Nox. This stands out to be one among the best lightweight tools. You can use this emulator on both Windows and Mac systems. This emulator is specifically designed for gaming purpose. It also works well for FPS game lovers. The emulator provides you with various features like multi-instances in case you wish to operate more than one tab. In case you are in a situation where your PC hangs constantly because of some emulator, shifting to Nox Player will wipe out all your worries. This emulator has been developed with the ability to run all the resource-heavy games. If you are a game geek, let me tell you, the tool allows you to map the keys as per their choices. You can use external control also. You get Google Play Store on Nox Player and also get other Google Applications that are in-built. The user interface is similar to Vanilla Android UI and that’s what makes it my personal favorite. With this emulator, you get the exact feeling of using an Android device on PC. Being a lightweight android emulator, this is an absolutely portable emulator that does not have to be set up through any process. You can access this emulator by the executable file. You are given features like easy installation and configuration. You can customize the settings on this emulator and also create a virtual SD Card. 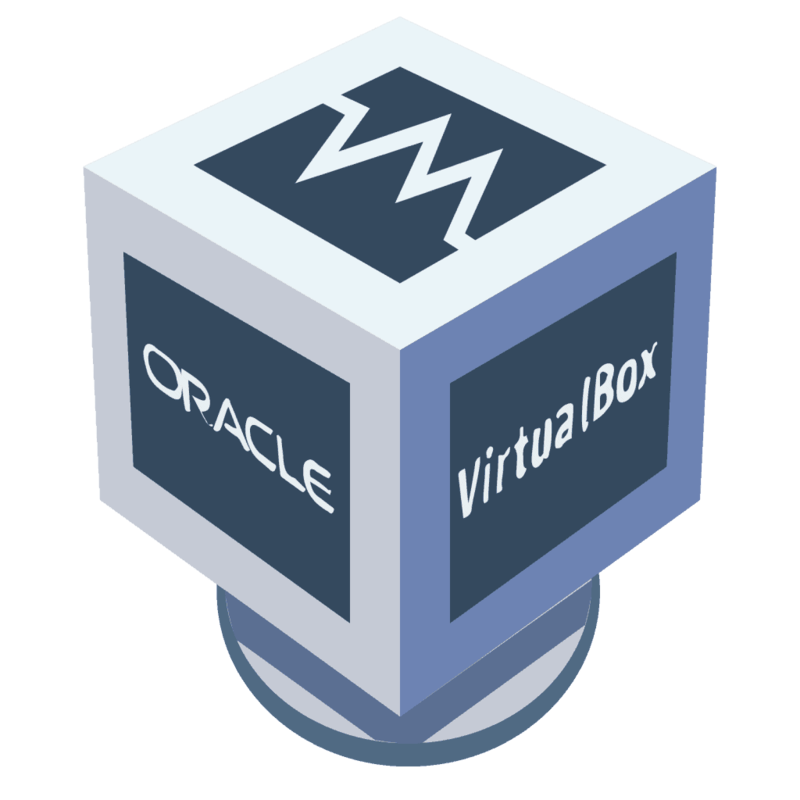 Another Lightweight Android emulator on our list is the Virtual box that allows its users to run any sort of Android operating system on your computer. This emulator is generally used by the developers to test the android apps. 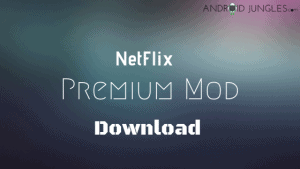 This is considered to be one of the lightest weight android emulators. Being one of the best choices for Application developers, Geny motion is that Android Emulator which gives its users the freedom to choose the Android device while performing the setup. This tool is free for personal use and has a premium version for the developers. You can run various games on this emulator too however, the best advantages can be used up by the app developers. The application developers can emulate any Android device with the help of Geny motion Lightweight Android Emulator. It runs Android as a service either on the cloud or on your PC. An in-browser lightweight emulator that proves to be a great tool for developers and allows them to test their apps on various Android versions even if you do not have those devices in hand, is the Manymo emulator. Running on high speed, this emulator provides its users with a much better service overall. Because of being deeply integrated with the visual studio and xamarin studio, Xamarin is one unique Lightweight android emulator. Its unique features like better and faster shipping of apps, make it one of the best android emulators. Xamarin is made with x86 architecture. This is the reason that makes Xamarin much faster to run and helps debug, simulate, demo or run Android apps in a fast way with lesser interruptions. Droid4X is another on our list of best Lightweight Android Emulators. This emulator is a great spot for game geeks as it provides the best experience in case of Android apps and video games on a much bigger screen with improved sound effects. Droid 4x has got many advanced features like real-time video recording, Joystick Simulation, GPS Simulation, Keys simulation and much more. Given below are the basic requirements that your PC should meet if you wish to run this emulator on it. Having the most user-friendly interface, You Wave has become popular for the same cause. 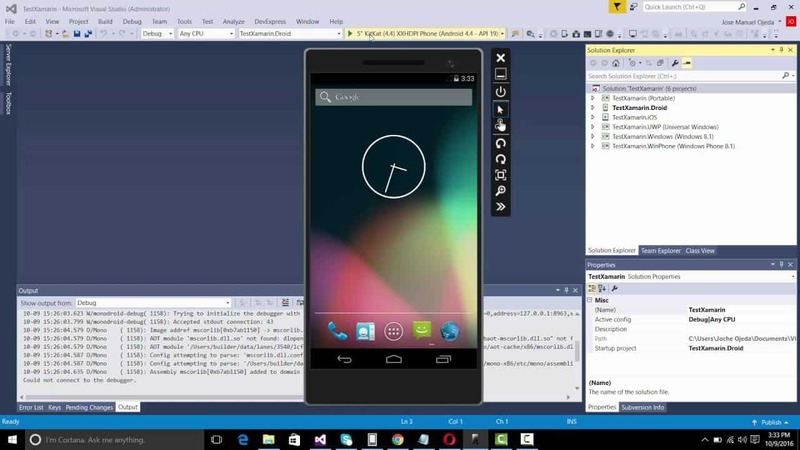 This android lightweight emulator is compatible with almost all the versions of Windows. You get an amazing option of Multiplayer through which you get volume control buttons, dynamic rotating for android games. You get an SD Card functionality along with the emulator which enables you to share any files or folder from your Computer and Virtual machine and vice versa. Give below are a few requirements to be considered to run You Wave android emulator on PC. If you could tell through the name, MEmu OS seems to be all about games. Another great spot for our gaming geeks. This is a lightweight Android Emulator based on the Android 7.1 Nougat. This player performs almost all the resource hungry games. MEmu OS is not available for Mac but does work on Windows OS. From reasons like not having an android phone to play games to experiencing better HD Graphics of a game and sound effects on huge speakers, you can make use of this player named MEmu OS. On this player, you can play games like a very popular game like PUBG mobile, Asphalt 9, Fortnite for Android, etc which have been found to be running well on this emulator. Given below are the official system requirements your computer must meet so as to run MEmu OS Android Emulator. Hardware Virtualization technology should be enabled in BIOS. 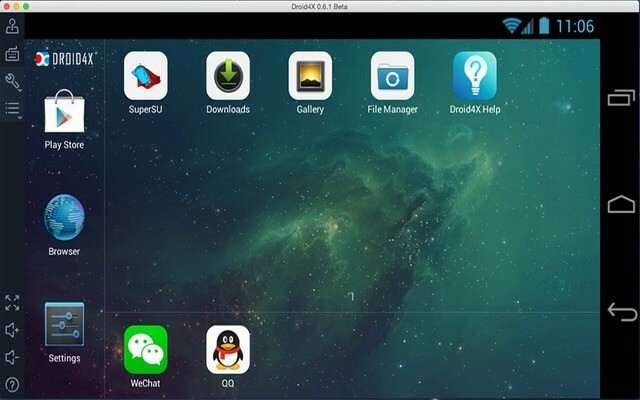 Similar to the MEmu OS and Nox Player, the Andy Android Emulator focuses only on gaming. The objective with which this player was developed is to provide its user with a better gaming experience on the computer. With this emulator, the graphics of the computer are utilized so as to produce the best results for any game that user runs on it. For a time period of a few years, the Andy ran on one version of Android that was eventually considered as its backlog but then just recently in the month of April 2018 the company has updated to Android Nougat. Android Access to a local file system. Even though Remix OS player has been discontinued now, it still works well on the systems that supported it when it was launched. It was released by Jide as a stand-alone app so as to emulate the Remix OS on PC. It was released for Windows specifically. This player is inspired by the user interface of Vanilla Android. This player was optimized at the first place for gaming and designed by Jide as an inbuilt app for running on a PC. The Remix OS Player was released to run on Android Marshmallow. No updates since then have been made for this player. Virtualization Technology enabled in BIOS. For all the game freaks this is yet another spot to choose. This player runs only on the Windows Operating System. This player basically provides a smooth base for all your android games to run on your PC. This player is built on the Android x86 architecture. Nearly all the applications that are available on Google Play Store run on this player as well. The very unique feature this player has got to show you all is the video recording feature. It allows you a keyboard mapping and does support a remote controller as well. The CPU Supports VT-x or AMD-v virtualization that can be opened in BIOS. The Graphics card supports OpenGL 2.0. A memory of at least 512 MB. The resolution of the system should not be lower than 1024*768. At least providing 3 GB hard disk space to install KOPlayer and at times may need 8 GB or more. Now, this depends on the applications that you have installed in the virtual machine. You need to have a good and working Internet connection for installation and update. Not exactly an android emulator thing but this emulator has an absolutely different operating system that has its origin from a custom ROM for Android. This emulator is based on x86 architecture. You can run this one on any Tablet, Laptop or PC that uses the UEFI Boot. The bliss supports the devices that are powered by the CPUs from Nvidia, Qualcomm, Intel, and AMD. The highlight of the Bliss player is that this is based on the latest Android 8.0 Oreo firmware. And this is the feature that no other player has yet got. In my Opinion, Bluestacks and then Nox App Player prove to be the best and most convenient lightweight android emulators. So this was all about Lightweight Android Emulators. I hope you all found the article of use. Feel free to let us know in the comment section below in case you come across any doubts or have any queries or suggestions for us to write on. For more such articles, keep visiting our Page- Android Jungles or you can also Subscribe to our Newsletter to keep receiving timely notifications of our posts. My Pc Does not support Virtualization and Nox App Player doesn’t work for me. Are there any others? we have shared 14 Android Emulator try any other.